On any other day but 5 November, Lewes is a sedate, historic and exquisitely pretty market town in a broad valley among the chalk downs of East Sussex, a few miles inland from Brighton. Yet on Bonfire Night – or ‘the Fifth’, as it’s universally known in these parts – it becomes the scene of a dark carnival of fire and noise on a scale unmatched anywhere else in Britain, on any night of the year. Of the small handful of English towns and villages, spread mostly across the southern counties, that still celebrate the Fifth in the traditional manner, Lewes has long been the largest, the proudest and the wildest. A century ago, it was already widely recognised as ‘the strong citadel of Bonfiredom’, where ‘the celebration of the Fifth acts like a fever’ and ‘confusion reigns supreme in the old streets'(1). But the origins of the Fifth in Lewes, and the reasons for the full-throated and bloody-minded persistence of its celebrants, must be sought earlier still, in the extraordinary scenes of the years around 1850 that gave birth to the ritual so jealously preserved and spectacularly commemorated today. The first intimations of the drama begin at dusk, as the cold of the early winter night descends. Visible between the shoppers in hats and coats hurrying up and down the steep inclines of the high street are apparitions who seem to have slipped discreetly across the borders from another world. Whispering children in elfin cloaks and hoods dash in and out of each other’s front doors; a stray cavalier in sumptuous ruffs and red satin pauses for a cigarette in a side street. A mustachioed soldier in pith-helmet and gold braid loiters, nipping at his hip-flask; small groups of young men in blackface and hooped guernsey jumpers stealthily pull trolleys piled high in mysterious mounds, wrapped in tarpaulins and leaking petrol. Behind the scenes, the town is being mobilised on a scale rarely seen in peacetime, for an operation that will transform it from sleepy market town to temporary war-zone. Paradoxically, it is precisely because Lewes remains a sleepy market town that its riotous bonfire tradition has survived. It is not a single large-scale operation that is being mounted at this point, but half a dozen competing ones. Each district of Lewes, and many of its outlying villages, have their own bonfire society; each is massing in one or another corner of town, donning disguises and forming ranks for their grand procession, on which flaming torches, dazzling flares, marching bands and an aural assault of squibs, bangers and firecrackers will accompany them through the streets of their section of town. Let us follow the banners of the Cliffe Bonfire Society, whose domain is the quarter of town below the old bridge, backed up against the chalk cliffs that shear the valley from the high downs above and give the district its name. 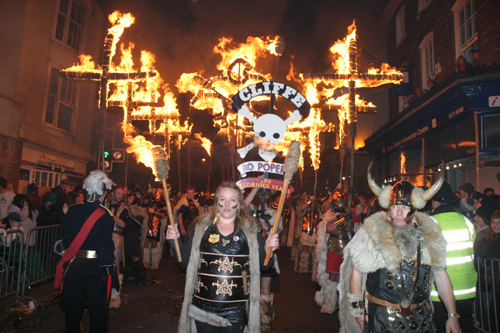 The Cliffe is the largest of the bonfire societies, the most breathtaking in artistry, and one of two that can trace their origins back to the years in the mid-nineteenth century when today’s bonfire rite was first constituted. For over a hundred and fifty years, broken only by the odd typhus epidemic and two World Wars, its procession and subsequent firework display have maintained and embellished a tapestry of rituals in which both the history and the myths of bonfire are ever more tightly woven. Long before the Cliffe are visible through the crowds that pack the high street, the fire from their torches ripples the night air, smearing the outlines of the neat brickwork and half-timbers of the old town and illuminating the embroidered banner that hangs high across the narrow span, defiantly proclaiming ‘No Popery’ in squat red letters flanked by the society’s skull-and-crossbones insignia. A distant cacophony resolves itself into the sound of bagpipes and marching bands peppered with an approaching firestorm of bangs, flashes and Chinese firecrackers reverberating off the shopfronts. The crowds part before the advancing wall of heat, light and noise, and the vanguard of the procession materialises through the smoke: massed ranks of full-bearded Vikings in tunics of furs and animal skins, faces hidden behind horned helmets of beaten copper glinting in the firelight, carrying petrol-soaked crosses ten feet tall on thick wooden poles, their fur-booted feet plodding determinedly under the weight. 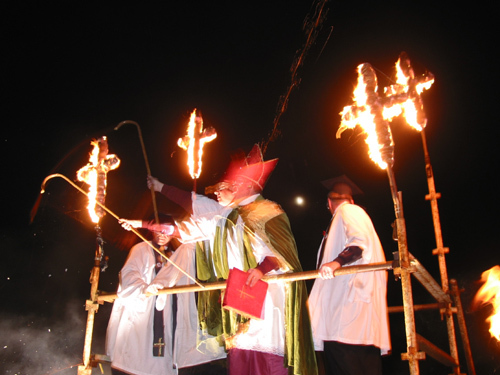 When their crosses are torched at the climax of the procession, the knowledge that the Vikings are a relatively recent addition to the scene – only introduced in the 1950s – does little to dispel the sense of a pagan rite dignified by antiquity, a blazing rebuttal to the death of the year in cold and darkness. Behind the Vikings, the procession streams out of sight, a succession of torch-bearing battalions whose range spans continents and centuries in a bewildering and exotic masque. Victorian regimental uniforms of red and gold, tartan, bearskin- and pith-helmets, are interspersed with Royalists in wigs and brocade, sombre privates from the Great War and darkly elegant military dandies in skull-and-crossbones battledress. Giant Remembrance wreaths roll through, followed by bluestocking sufragettes whose banners proclaim ‘Votes for Women’, followed in turn by cardinals in tall mitres and blood-red cassocks. Weaving between each of these are the hundreds of Bonfire Boys and Girls, whose mufti of soot-streaked faces, black and white hooped guernseys, white trousers, red sashes and bandanas forms the backdrop to the tableau, and whose origins are inseparable from those of bonfire itself. The Bonfire Boys are both orderlies and mischief-makers, jaunting along beside the revenants of the past, swigging from kegs of scrumpy, nonchalantly distributing deafening squibs among the crowd, gathering up the flaming detritus of discarded torches and tossing them into the ‘tar barrels’ lugged by their fellows, oil drums cut in half and mounted on wheels that trundle and clank over the cobbles, constantly exploding with bangers that reverberate shop windows and send chimneys of sparks high into the air. The cavalcade’s musical acompaniment matches its sights, a flux of precision and chaos. Several full marching bands are interspersed through the procession: jaunty ragtime brass, a bagpipe ensemble, military oompah, boy scout orchestras stumbling over burnt-out debris as they read from the sheet music mounted in front of their noses, concentrating grimly on keeping in step and time. Tradition is seasoned with innovation: over recent years a drum troupe of PVC-wrapped goth fetishists and dreadlocked urban shamen have coalesced to fire-juggle and pound out their fierce tribal beats. But ever constant are the bangs and explosions over which all the music struggles to make itself heard, and which forces both participants and observers over a decibel threshold where loud detonations no longer startle, and where the relentless noise eventually produces a strange enervation, both thrilling and curiously calm. For those watching this display it is immediately clear that, most unusually for such a sumptuous and spectacular event, the intention is not to please the spectators. The Fifth is for the bonfire societies themselves. Visitors are at best tolerated: one who finds a Bonfire Boy engaging them in friendly conversation should check the pavement by their feet, where the odds are that a surreptitiously dropped squib is about to explode. Public explanations of the event tend to be perfunctory – officially, it’s simply a commemoration of Guy Fawkes’ Night like any other across Britain – yet the procession teems with slogans and banners that proclaim other messages entirely, or develop the meaning of bonfire in unexpected ways. To the outsider, these can appear alarming: the profusion of anti-Papist imagery raises the spectre of sectarian hatred, while the Cliffe’s belligerent and skull-studded motto, ‘Death or Glory’, gives little reassurance against the possibility of violence and anarchy. Both sectarian prejudice and violent anarchy are indeed firmly rooted in the traditions of the Fifth; while both have become to some extent symbolic, the right to parade such incendiary symbols remains at the core of the modern celebration. But there is more being remembered here than the Gunpowder Plot. A finely embroidered banner of William of Orange’s landing in 1688 reminds us that the Fifth is also the anniversary of a tyrant deposed and liberty restored, and more recent commemorations such as female suffrage align this liberty with the twentieth century’s progressive causes. Another solemn banner suggests, by contrast, a sectarian history even older and more bitter than Guy Fawkes: the commemoration of the Lewes Martyrs, seventeen local Protestant citizens burnt at the stake in the high street under Queen Mary in 1557. ‘Enemies of Bonfire’ are paraded in effigy: local councillors who have attempted to curtail the celebrations, pigs’ heads in riot helmets representing the previous year’s heavy-handed policing, Home Secretaries who have attempted to make political capital out of deploring Bonfire Night. Slogans, banners and causes traverse the modern political spectrum from left to right and back again, while plainly uniting the procession that marches beneath them. There are contradictions here, but there is also a history within which they are all assimilated, and which offers the Fifth its continued raison d’être. As one of the most prominent banners announces to a torch-lit and shell-shocked town, ‘We Burn To Remember’. The processions follow their designated routes from their home corners of the town through its centre, snaking past one another in cacophonic chaos, bands struggling to keep time as they weave through each others’ ranks. The Vikings of the Cliffe cross paths with the Zulu vanguard of the Borough Bonfire Society, whose origins date back to the Boer War and whose feathered headdresses tower almost as high as the Vikings’ crosses. 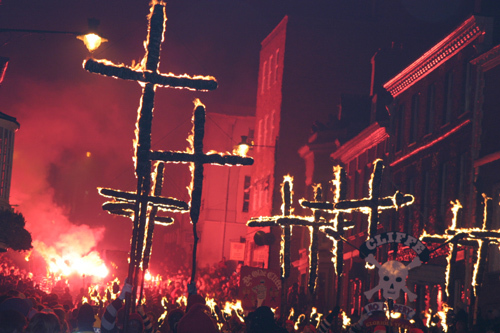 All the processions intersect at the Lewes Martyrs’ Memorial on the high street, where Remembrance wreaths mark the focus for a mass conflagration of bangers, livid pink emergency flares and hand-held ‘illuminations’ of catherine wheels. But this is not the end of the ceremonies, only the end of their beginning. Now, the processions peel apart and head for their own turf, the fire fields on the edges of town where each will mount a firework display to outdo the others. The Cliffe field was until recently a free-for-all, thousands of visitors packed tight in dark, muddy and drunken chaos, but after one too many knife incidents and rocket injuries it is once more strictly controlled: a semi-private celebration for the participants themselves. A bonfire the size of a house is set alight, the beacon toward which the Cliffe process through the darkness, now trailing behind them the giant effigies stuffed with explosives whose detonation will frame the display: a huge Guy Fawkes, an equally towering Pope and, dwarfing both and teetering on its flatbed truck, a topical centrepiece to stand as the emblem of the year. These are exquisitely sculptured tableaux, scabrously witty and casually obscene, in a line of descent from today’s Spitting Image puppets to the James Gillray lampoons of their heyday. Some years’ effigies are local in their targets, some international; they frequently combine twin themes to brilliant effect. Recent Fifths have seen President Clinton dressed as a stars-and-stripes superhero, ‘Captain Viagra’, clutching a pendulous phallic missile decorated with the motto ‘In Gob We Thrust’ – and, in a nod to Gillray’s famous image of Pitt and Napoleon, a demented President Bush gorging on a pie in the shape of the globe. The sensibility is sharply defined but, once again, hard to contain within a modern political frame. Traditionally right-wing issues such as Brussels and farming, for example, have made regular recent appearances – EU Commissioners spattered in slurry, their arms embedded in cows’ sphincters, and in 1992 a memorably quixotic John Major mounted on a dinosaur from the summer hit Jurassic Park and tilting feebly at the European flag. Yet in 2000, the year of foot and mouth, the target was Labour’s pusillanimous failure to repeal Section 28, represented by a stern Gordon Brown spanking a stockinged and suspendered Peter Mandelson over his knee. The motto beneath this tableau, ‘Don’t It Make Your Brown Eye Blue’, was typical in its insouciance, provocatively politically incorrect, but in the service of a defining politically correct cause. If there is any unifying theme in the centrepieces, and indeed in the event as a whole, it is the ridicule of authority, which knows no political favourites. It is a theme that the Cliffe cheerfully turn against themselves: their own officials, often the drunkest members of the crew, proudly sport pompous uniforms decorated with slogans like ‘Chief Official Wanker’. The sculptures are designed in tight secrecy by a fireworks committee, and the climax of the procession is the first sight that the Cliffe themselves have had of them. As they are led to their site of execution, and the procession breaks rank to become spectators, attention turns to a scaffolded gantry that stands ten feet high in the foreground of the display. When all preparations are complete, this is mounted by a robed figure bearing crook and mitre, ‘The Archbishop of the Cliffe’, and two accompanying ‘bishops’ in clerical dress, their protective welding visors both indicating and inviting the ritual to come. Opening an ecclesiastical tome, the Archbishop attempts to read a Latin mass to the crowd over a deafening chorus of boos and chants of ‘Burn the Pope!’; bangers and squibs rain onto the gantry from all sides, until the bishops become the eye of a storm of flashes, bangs and smoke. Through his ordeal by fire, clutching at his mitre, smoke billowing up through the cassocks of his fellow bishops, the Archbishop proceeds through a litany – full of topical wit, though inaudible beyond the front row – of charges against Guy Fawkes, the Pope and the Enemies of Bonfire, interrupted by the rhetorical call of ‘What shall we do with him?’ and the ever more emphatic audience response of ‘Burn him!’. When the hoarse spectators have reached fever pitch. and the bishops can endure the assault no longer, the sermon is concluded and the display begins. Guy Fawkes, then the Pope, and finally the effigy of the year, become the centrepieces for a pyrotechnic performance of savage intensity. The scale, of course, is spectacular, but there is a brutality of intent that sets it apart from the usual grand public display. There are the conventional high, blossoming starshells trailing gold and silver showers, but they are framed by deafening bangs that shudder the ground for minutes on end and fusillades of retina-scorching magnesium flares that seem to rip the sky apart; each display is terminated with extreme prejudice as the centrepiece is detonated, ripped grotesquely limb from limb, its carcass left burning in tatters. It is a display that elicits not the typical response of oohs and aahs; this is rather the full-throated roar of satisfaction vented, a mob burning their enemies on a cold winter night. These days there is irony, to be sure, and a ribald hilarity that must have been present from the beginning; but beating beneath them still is the pulse that characterised bonfire’s origins. As a newspaper report observed over a hundred and fifty years ago, ‘there is a strong dash of earnestness in the fun inseparable from this demonstration’ (2). 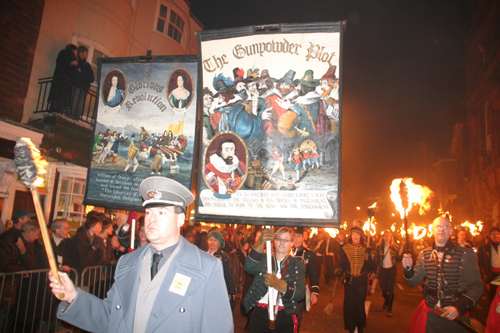 It seems unlikely that celebrations of The Fifth in Lewes date back in any recognisable form to the Lewes Martyrs, or even to the Gunpowder Plot. Throughout the seventeenth and early eighteenth centuries the events of Bonfire Night are scantily recorded; across England generally the official civic observance became dutiful rather than enthusiastic, a courtly and parliamentary event rather than a popular one (3). It endured as a public holiday that united the Church, for which it affirmed the establishment against the Catholic threat, and the State, for which it commemorated the Whig triumph of 1688 in securing constitutional liberties (4). It was only in the second half of the eighteenth century, after the Jacobite Rebellion of 1745, that it began to chime with a new public mood that recognised the anniversary of the Gunpowder Plot as a time-honoured rallying point for a new sectarian venom against the assault on ‘English Liberties’. In the growing towns and cities it became a night where young men, particularly artisans and labourers, could let off steam – and bangers, crackers and squibs – under a patriotic banner, often with the implicit or explicit support of an anti-Catholic gentry (5). Such was the case in Lewes, where by the late eighteenth century there were warning signs of Bonfire Night’s potential to get seriously out of hand. In 1785, ‘the greatest riot perhaps ever known at Lewes’ (6) began when a bonfire was assembled at School Hill in the centre of town, a large crowd of young men stoking it until reached a ferocity that terrified the local residents. They complained to the magistrate, who read the Riot Act to the crowd and attempted to lead an effort to pull the fire apart; the crowd resisted, scuffles broke out, and the magistrate was knocked down and rolled into the river, accompanied by the ‘firing of rockets, squibs, grenades etc.’ (7). The disorder persisted until midnight, by which time enough officers and Justices of the Peace had been assembled to disperse the rioters. Arresting them, though, was harder: in a pattern that would repeat itself for decades, many of them broke away and melted into the night, while others fought off the authorities to free their comrades before they could be secured and locked up. This kind of disorder became widespread across England in the early nineteenth century, as Bonfire Night became one of ever fewer opportunities for the burgeoning ‘lower orders’ to vent wider social frustrations. The conscription and food riots of the Napoleonic Wars had produced new anxieties among the propertied classes about public order, and new emergency powers to maintain it; at the same time, the disenfranchised majority had become increasingly politicised by radicals like Tom Paine (who worked in Lewes as an excise officer in the 1770s, and is now the town’s favourite son). As the gentry and leading citizens withdrew their support from the festivities, shadowy and anonymous ‘bonfire gangs’ came to fill the vacuum, collecting subscriptions, coordinating crowds and building bonfires and effigies. Particularly across southern England, the Fifth took on the character of a night of misrule, where masks were worn, dissent vocally expressed, authority figures parodied and their houses targeted with bonfires, tar barrels and rockets (8). While such dissent plainly had a political dimension, it was an awkward fit with the nineteenth century’s emerging political structures. By the 1820s, grass-roots campaigns for political reform – the union movement and, after the 1832 Reform Act, the Chartists – were determinedly shunning civil disobedience in favour of lobbying and peaceful demonstration: rioting, for them, was an unwelcome hangover from the mob violence of the eighteenth century, easily dealt with by the authorities and politically counterproductive. The causes of bonfire, in this context, were unsophisticated, amounting to little more than a right to make mischief: as one newspaper dismissed them, ‘the lower classes absurdly consider the suppression [of bonfire] as an infringement on their rights as Englishmen’ (9). Bonfire put down its deepest roots in rural market towns, typically in the southern counties, where industrialisation, urbanisation and working-class politics were at their weakest. Nor was the energy of the popular demonstrations easily harnessed by either of the political parties. Their anti-Catholicism and patriotic committment to Church and King were in the Tory spirit, but their unpredictable violence made them dangerous bedfellows for local grandees, and attempts to co-opt them for overtly political purposes could backfire in ridicule or worse. They also, on occasion, adopted unambiguously Whig causes: in 1831, after the Reform Act had been rebuffed at the first attempt by the House of Lords, the bishops who had voted it down became the year’s most popular bonfire effigies. To the chagrin of politicians, what had become the most popular festival of the year in a huge swathe of England’s heartland, from the Home Counties as far west as Devon, had turned politics itself into one of its most succulent targets. In Lewes, the riotous celebrations were by now becoming more ritualised, and taking place on a disturbingly large scale. The shadowy coordinators, their identities frequently concealed with masks and blacked-up faces, were first dubbed ‘Bonfire Boys’ in 1827; in 1832, for the first time, blazing tar barrels were rolled through the streets and set in motion down School Hill, trailing incendiary debris behind them (10). When police attempted to seize the barrels, the Bonfire Boys turned the chase into a new sport and, in 1834, took to piling the barrels into a huge bonfire outside the County Hall. The same year, in nearby Brighton, when the High Constable attempted to suppress the revelry, a stone-throwing mob smashed the windows of the hotel where he was staying. In Lewes, as elsewhere, the Fifth was exposing and exacerbating an ugly rift that was developing in the town between the emerging middle class – propertied, often Liberal in politics, nonconformist in faith and puritan in inclination – and the agricultural and labouring poor, in their view asserting their traditional rights, covertly supported by the longer-established Tory and Anglican gentry (11). The struggle for control of the town on the Fifth became ever more hotly debated through the 1840s, and the celebrations ever more daring and dangerous. The flashpoint came in 1846, when ‘disguised persons in several parties and accompanied by a large mob’ (12) opened the evening in now-traditional style by dragging tar barrels through the town to a large conflagration outside the County Hall, after which they turned their attention to the house of the local magistrate, Mr.Blackman. When Blackman emerged from his house and attempted to arrest one of the ringleaders, ‘he received a blow over the eye from one of the bludgeons which was on the instant raised, and he was felled to the ground’, and ‘carried into the house in a state of insensibility’ (13). The Bonfire Boys allegedly had no idea whether he was alive or dead, and little interest: the bonfires, squibs, rowdy singing and drinking carried on unabated for several hours more. This incident was a trigger for the anti-bonfire party to mount what they saw as a long-overdue campaign to curtail the excesses of the Fifth in Lewes. A pamphlet entitled Observations on the Doings in Lewes of the 5th November 1846, signed anonymously by ‘An Old Inhabitant’, fired the first shot in a campaign that would build through 1847 to enlist the editorial support of the Sussex Advertiser and mount a petition to the Magistrates’ Bench. Old Inhabitant argued that the ‘disgusting parade of disguises, bludgeon and riot’ (14) should now be consigned to the past. He could not imagine a more ‘disgusting sight’ than ‘a large body of human beings in a state of savage excitement, slaves to the worst feelings and impulses of which their nature is susceptible’, taking over the town with impunity in disguises that recalled ‘the poison-cup and the stilletto of the Italian bravo’. In his view, the authorities had no choice but to ‘adopt such decisive measures’ as would thwart any ‘unseemly proceedings’ in the future. By September 1847 his sentiments had been echoed in a petition of 32 ‘leading inhabitants’, warning the local magistrates that ‘we have great reason to apprehend that such riotous and tumultuous proceedings will be attempted upon the Fifth of November now next ensuing’ (15). The debate had bubbled all year, with local newspapers dividing along recognisable party lines: the Liberal Advertiser calling for the festivities to be suppressed, the Tory Express deploring the excesses, blaming the volume of alcohol consumed and proposing a compromise, the celebrations moved perhaps to a less contentious site outside the town. From the Bonfire Boys themselves there had been silence, but few doubted that a show of strength was afoot, and they were to be proved right. At the stroke of midnight on 4 November, the rumbling of tar barrels was heard and a crowd of Bonfire Boys began their procession down the high street, ‘preceded by a man armed with a pick axe and disguised by a mask, and followed by about eighty others armed with bats and bludgeons, shouting and making an awful uproar’ (16). As ever, the local forces of law and order were outnumbered and outgunned. A handful of constables held a chain across the street; several Bonfire Boys fell over it, eight were arrested and the remainder scattered into the darkness. But the petitions to the magistrates had not been in vain: by noon of the Fifth, eighty police had arrived on the train from London, and by dusk they had mounted a cordon in front of the County Hall, where the crowd gathered for a stand-off. For a while they ‘amused themselves with using insulting expressions towards the police and special constables, an occasional rocket being exploded in the thickest part of the crowd’, but by eight o’clock ‘a disposition was manifested by the crowd to go to greater lengths’ (17). The Brighton mail coach arrived and attempted to make its way past the crowd, but a stray squib caused the horse to bolt. It ran into a shop front, to cheers from the crowd and another volley of squibs, and the magistrate and local landowner Lord Chichester hurriedly ascended the steps of County Hall and read the Riot Act. The police charged the crowd and, although several constables were seriously hurt in the melee, the crowd was eventually dispersed. The London police were despatched back to the capital the next morning; but although the Fifth was finished, the Bonfire Boys were not. That night, and every night for the rest of November, over a hundred of them descended on the town to rampage. The streets blazed with tar barrels, the air cracked with fireworks and those who had mobilised the campaign against bonfire were singled out mercilessly. The offices of the Sussex Advertiser were subjected to nightly assaults, ‘which appear to have been expressly selected’, as the editor grimly noted, ‘with a view to retaliation for the remarks we have felt it our duty to make’ (18). By the end of November the magistrates were forced once more to swear in special constables, draft in more police reserves and dragoon the town back to order. Once again, the Bonfire Boys proved slippery, their ringleaders impossible for magistrates to identify. Only four arrests were made, and the suspects were all were eventually discharged, their defence solicitor arguing that the disturbances had been ‘not what is ordinarily termed a riot, but was the keeping up of an old custom and might be regarded more as a frolic’ (19). 1847 had ended in a conspicuous triumph for the forces of bonfire, and one that would endure. Being drafted to keep law and order on the Fifth was no-one’s favourite detail: special constables were regularly fined for deserting their posts or refusing to serve in the first place (20). Further, attempting to supress the celebrations invited random and anonymous acts of retaliation: as the Advertiser observed, ‘let any individual only be suspected by the mob as unfavourable to them, and forthwith he is a marked man – if he venture among them he is personally ill-used or insulted, or his house beset with tar barrels down to the front of it and burnt’ (21). It seemed that the compromise mooted by bonfire’s moderate supporters was the best solution, and in 1848 the crowd was led away from the high street to the outlying Wallands Park estate, where they roared, sang, drank and exploded squibs and rockets to their hearts’ content. The problem, it seemed, was solved, and the exercise was repeated the following year without incident. In 1850, however, the story took the decisive twist that would produce the ritual of the Fifth as it is constituted today. Following the Catholic emancipation of 1829, the Pope had that year restored the hierarchy of Roman bishops in England, headed by a new Archbishop of Westminster. This move was characterised in Anglican heartlands as ‘the Papal Aggression’, and the response to it was voluble, persistent and extraordinarily bitter. ‘Protestant England’, declared the Sussex Agricultural Express, ‘is fairly aroused…we look with shame at the depth of degradation to which half-a-century of concessions to Rome has led us’. The prospect of the nation being ‘parcelled out into Romanist dioceses’ mobilised anti-Papist sentiment to a degree that had not been seen for a century, and established a climate where the traditional affirmations of Bonfire Night were no longer too extreme but too mild. ‘If all that we are doing’, the Express concluded, ‘is the burning of an effigy, or the shouts of a mob, Rome will regard it as no more than the flash of last year’s rockets…this monstrous project must be defeated’ (22). 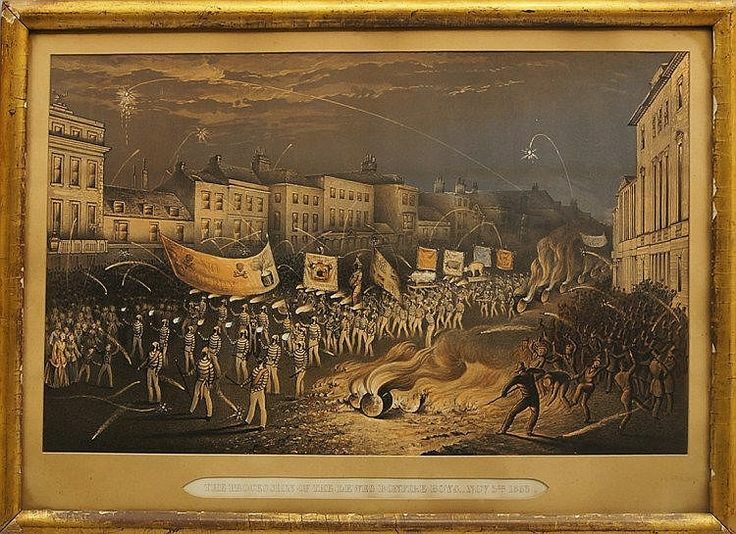 All across southern England, the Fifth of 1850 was celebrated with unprecedented intensity, encompassing towns where bonfire had previously been restrained or entirely absent. In Farnham, for example, it was recorded that ‘our usually quiet town was yesterday the scene of a most determined and universal, though pacific, ‘No Popery’ demonstration’ (23). In Brighton there was a huge turnout, but the ‘evening passed off better than usual’: the consensus was that attempts at suppression had made the disorder worse, and most concluded that ‘forebearance on the part of the authorities is the better policy’ (24). In Lewes, the Bonfire Boys seized their moment and returned to the town centre with a vengeance. 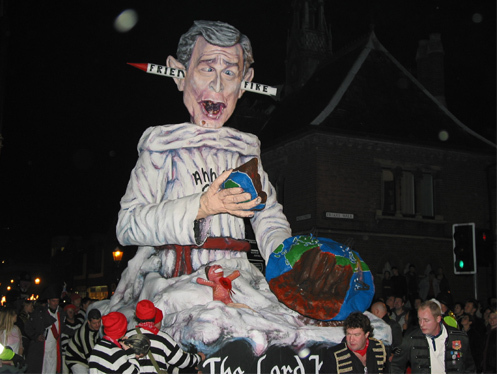 The streets resounded with the blasts of the fat home-made squibs known as ‘Lewes rousers’, and for the first time the tar-barrel procession was set ablaze at midnight at the spot where the Lewes Martyrs had been burnt at the stake by Marian Papists. The current alarm was compounded into an ancient history, and the celebration was taken to imply a permanent permission to return to ‘old customs’, an assertion of traditional liberties now regarded as dating back three centuries (25). The following year, it was as if it had never been otherwise. ‘The streets of Lewes’, recorded the Express, ‘presented the usual aspect: squibs and crackers were fired in all directions’. The Bonfire Boys roamed freely, and their ‘blackened faces and ingenious disguises appeared to afford the highest amusement to the inhabitants’. For the first time, a separate celebration was noted on the far side of the river, where ‘at Cliffe Corner a capital effigy of the Pope was consumed on a grand bonfire’. In the centre of the town proper, a theatrical flourish was added to the bonfire ritual: ‘a figure dressed as a Romish priest, which was hailed with loud cheers by the assembled crowd as ‘the Cardinal”, accompanied by another figure in ecclesiastical drag acclaimed as ‘the Pope’, were strung up over the bonfire in front of the White Hart Inn and ‘pelted mercilessly by squibs of all sorts and sizes, which came thicker and faster’ from a crowd chanting the verses of ‘Remember, Remember the Fifth of November’ or, as the Express drolly put it, ‘loudly avowing their ignorance of any pretext for forgetting the existence of Gunpowder Treason’ (26). Although the Pope-burning was an innovation, a topical response to the issue of the day, even on its debut it seemed deeply rooted in tradition, and it would rapidly become hard to believe that it had not always been an integral element of the night. Many more elements of today’s ritual were woven into the celebrations in the next two years. On the Fifth of 1852 ‘the town was speedily alive with squibs, crackers, rockets etc.’, and at ten o’clock ‘the great event of the night took place – the procession of the Pope and Cardinal Wiseman [the Archbishop of Westminster] to their appointed doom’. This time they were accompanied by the first local Enemy of Bonfire: the editor of the Sussex Advertiser, whose name was Bacon, noted that ‘an ingenious representation of the editor of this journal in the shape of a pig’ was also consigned to the flames. Once more, at Cliffe Corner, ‘a capital Pope was brought to the stake’. But at the time that these traditions were forming, they were still viewed as responses to a current emergency. ‘We have no doubt’, observed the Express, ‘that, by a conciliatory course, the time may come when the magic words ‘Remember, Remember, the Fifth of November/Gunpowder Treason and Plot’ may lose their spell, and the celebration may die out. But whilst Protestants are still languishing in Tuscan dungeons for reading the Bible to their maid-servants, surely the time has not yet come for abandoning one iota of our hostility to Rome’ (27). What was not yet foreseen was that the truculent insistence on the right to bonfire itself would prove to be a far more enduring force than the immediate crisis that had restored it. The following year more flourishes were added; the description of the 1853 celebrations, and even the panorama of them painted by Thomas Henwood, could almost stand for the event today. The threat of suppression seemed permanently on hold, and the Bonfire Boys were in full regalia, ‘worn rather to give effect to the scene than a disguise’. The Enemy of Bonfire was for the first time an international one: with the Crimean War looming, the centrepiece proclaimed ‘Down with the Czar’, ‘preceded by a large Russian bear, modelled with a degree of artistic skill’ that made observers almost ‘indignant at its transfer to the flames’. With the ‘cheers, Rule Britannias, and the Guy Fawkes ditty, the banging of squibs, the sounds of the band, all mixed together, and forming an inextricable confusion of sound’, the Pope, himself ‘a finished work of pyrotechnical art’, detonated at the climax of the ceremony. Across the river, the display mounted by the Cliffe was ‘certainly equal, if not superior, to that exhibited in the town…amongst the banners figured the famous inscription, ‘No Popery”. For the first time on record, too, the Cliffe had drawn a crowd of spectators ‘from Brighton, and other places in the neighbourhood, who appeared to enjoy the event amazingly’ (28). This was the year from which the earliest Bonfire Societies – the Cliffe, and the Lewes town society now known as the Borough – officially date their formation. After 1853 their organising committees, it seemed, no longer needed to hide in the shadows. Yet the bonfire wars were far from over, and within twenty years Lewes, and a tight network of smaller bonfire societies in the surrounding Kent and Sussex borders, would be virtually the only ones left standing across southern England. The tendencies that had attempted to end the celebrations in Lewes in the 1840s were on the march across the nation: rural towns everywhere were becoming larger, better policed, falling more firmly under the control of a middle class for whom protection of property and security of public space were prevailing and increasingly dominant values (29). Bonfire riots spelt the end of the ceremonies across the home counties from Essex to Surrey. Guildford, for example, had long rivalled Lewes in the scale of its celebrations, but failed to maintain them against the new civic backlash. In 1863 the bonfire crowd’s frustration burst its banks, and they set on a local magistrate’s residence with hammers and axes, demolishing windows, doors and the entire front of his house; but this type of disorder was now more easily dealt with, and by 1870 ‘scarcely a squib’ was in evidence across the town (30). There is no single or definitive answer as to why Lewes in particular stood firm against the tides of history. Part of it must be that, unlike towns such as Guildford that expanded in size and industry, Lewes remained a relatively small market centre, with much of the local population growth gravitating to nearby Brighton and Horsham. But a major factor seems to have been the local bonfire party’s highly effective mix of intransigence and strategic compromise. On the one hand was the opposition’s fear of reprisal from an event they had failed to suppress in the past, and to which the events of 1850 had given a greater public legitimacy; on the other were negotiated settlements between the civic authorities and the newly visible bonfire societies, who offered concessions such as planned procession routes and designated bonfire spots that contained the free-floating disorder. This spirit of compromise may have built on a particular local tradition of negotiation that had been glimpsed previously in the agrarian Captain Swing riots of 1830 that swept from Kent across the south coast to Sussex, then up through the Home Counties to Huntingdonshire and beyond. The Swing riots were brutally suppressed – nineteen public executions, and over 500 collaborators transported to Tasmania – but in Lewes, despite a large constituency of labourers ‘very active in promoting discontent and tumult’, they were resolved peacefully in a mass public meeting: the largest local landowner, Lord Gage, met with a deputation of tenant farmers on Ringmer Green, and agreed to their demands to reduce rents so that they could pay higher wages to their labourers (31). The rioters of Lewes had abundantly demonstrated their ability to play hard cops, but they had experience of playing soft cops too. By the late nineteenth century, once the Fifth in Lewes had weathered the anti-bonfire storm, it was increasingly hailed as a cherished institution and a quirky display of civic pride. Although it maintained its trademark denunciations of popery, the new causes it adopted were in tune with the prevailing imperialist mood, celebrating Britain’s colonial adventures in India, Egypt, Afghanistan and South Africa and pillorying Liberal leaders for their opposition to them. In 1875 the Daily Telegraph reported with admiration on the ‘people wonderfully dressed’ beneath ‘the great No Popery banner, attended by the Society’s brass band’, and the climax where once ‘the bishops had read a mock service and delivered up a fiery exhortation, the three gigantic effigies were brought up, amid howls and execrations’ (32). Tussles over the legitimacy and ownership of bonfire continued – Temperance activists campaigned against it, Orange Lodges attempted unsuccessfully to appropriate it – but by the early twentieth century it was widely felt that the celebration ‘was shorn of all real religious significance long ago…it is a survival and a revival of those old-time demonstrations against Romanism, which were the excuse for a licence for men to lose their reason for a few short hours in the year’. This opinion was offered by the journalist Arthur Beckett, whose fond pursuit of the ‘old-time flavour’ of the Sussex Downs generated pieces for the Spectator, the Idler and the Field that were published in book form in 1909 as a series of ‘impressions and reminiscences’ of the area (33). Beckett’s reportage of the Fifth in Edwardian times combines benign nostalgia with a sharp sense of the continuing dangers of the event. ‘The hooligan element is in strong force’, he warned; ‘it is better to carry a stout stick than to go unprotected’. 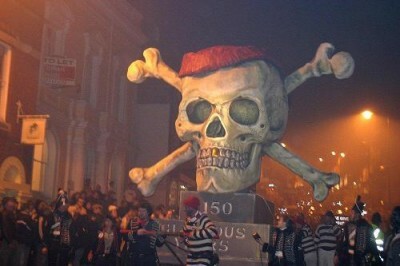 He further recommended that ‘it is well to wear old clothes and to cover the eyes with wire goggles against stray sparks…it is a wonder no-one is crushed to death, as the object of the Lewes Bonfire Boys is to spread confusion, and confusion reigns supreme in the old streets of Lewes for some eight or ten hours’. Nevertheless, ‘to the man unacquainted with Lewes, the spectacle of a sleepy town run mad on one evening of the year is a matter for marvel’. The fireworks are over, and visitors are being crammed like sardines onto the special late trains back to Brighton and London; but the final, most private and most potent act of Lewes’ ritual is still to come. Back in the centre of town, ankle deep in firecracker debris drifting like autumn leaves, the bonfire societies are regrouping, bangers and crow-scarers once more rallying their straggling marches back to their respective strongholds. Here, torches are piled on the sites of the original nineteenth-century bonfire spots, forming burning mounds around which the Bonfire Boys reassemble and the bands reform. At Cliffe Corner, Vikings mingle with cavaliers and bishops, hip-flasks and scrumpy kegs are drained and impromptu tea-stands steam the greasy night air. The Cliffe sort themselves into the best approximation of the early evening’s procession they can muster, and the company sets off for a last march around the town, bangers emptied from pockets into tar barrels and rubbish bins, explosion after explosion setting off shop fire alarms in their wake as, drunk on fire and noise, they claim the streets once more in celebration of their traditional rights. In every corner of town, the same acts are being performed: figures in cloaks and masks scurrying or staggering through side streets to bonfires where their societies are congregating. The brave, the drunk and the foolhardy leap over the fires to the cheers of their comrades, usually avoiding anything worse than minor burns, though serious accidents at this point are not unknown. Each year at Lewes brings its crop of battle-scars – rocket burns, eye injuries, hair set alight by falling firework debris – yet, perhaps remarkably, there has been no direct fatality of the Fifth since 1909. There is much experience and fire-sense behind the apparent recklessness, and everyone knows the emergency drill if you fall into the flames: hold your breath and roll out. The brass band segues into Rule Britannia, God Save the Queen, Land of Hope and Glory and Auld Lang Syne; a hand-held setpiece is sparked up, spelling out ‘Good Old Cliffe’ in fizzing catherine wheels; bonfire boys and girls pair up and sidle away; the final bangers and crackers are dumped on the fire in a shower of sparks, and the Cliffe’s ceremonial fire engine, a quaintly restored Victorian gurney, pumps an ironic, token splash of water onto the flames. The Fifth is over for another year; the preparations for the next will start almost immediately. The work of bonfire is never done, and the struggle to maintain it against rising tides of regulation, policing and local complaints demands constant vigilance. But it is a struggle to which the bonfire party of Lewes has been committed for generations, and one which has in its time subsumed many other struggles and causes. The language of Gunpowder Treason may have been written over repeatedly, but it has not been obscured; rather, it has become a palimpsest in which the history of Lewes is etched in ever finer detail.